You may remember me trying the Fly Lady Method, here, here, and here, to clean my home, but you may also remember that it didn't work .. So I have been following (more or less) a new method of keeping up with the plethora of chores. I went to pinterest for help of course and found many different ways. The one method I liked the most is where all the chores are broken down into daily chores, different chores for each day, and alternate chores done on different weeks. This way I am not overwhelmed with trying to figure out what needs to be done and when.. not to mention I don't have to do it all in one day! There have been a few times when I was physically unable to follow the chart for a long period of time.. pregnancy related issues, new baby, moving.. during those periods the chart was not followed and chaos ensued. Some times I would catch up slightly, but then soon fall behind again. After many failed attempts, instead of trying to catch up, I just started following my chart. Now I am actually making progress in bringing my house out of chaos and I'm trying super hard not to let it go. 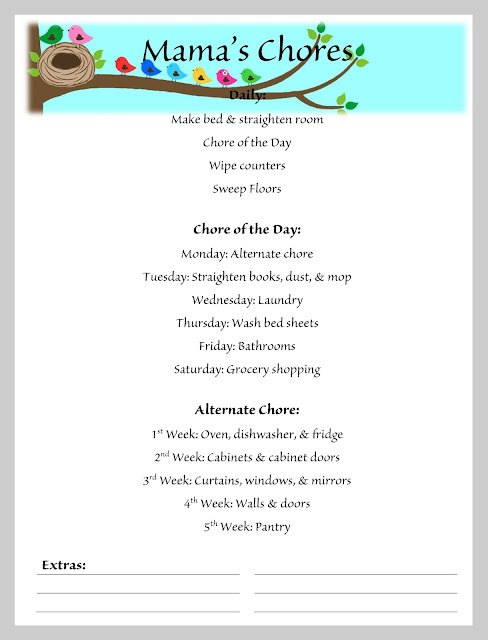 If I skipped a day though, no biggie, I just do what is on the chore list for the next day and don't worry about it. Unless it was laundry day. Laundry day simply cannot be skipped or else I'd be drowning again. So I either try really hard not to skip it or make it up on Friday. We all do some chores together, like washing walls, doors, and windows, or helping anyone else that needs a hand. We also do laundry together; sorting, loading, switching loads, folding, and putting away. Though they have been know to do a very thorough job, every once in a while I help the chickadees with their rooms just to make sure it gets done properly. 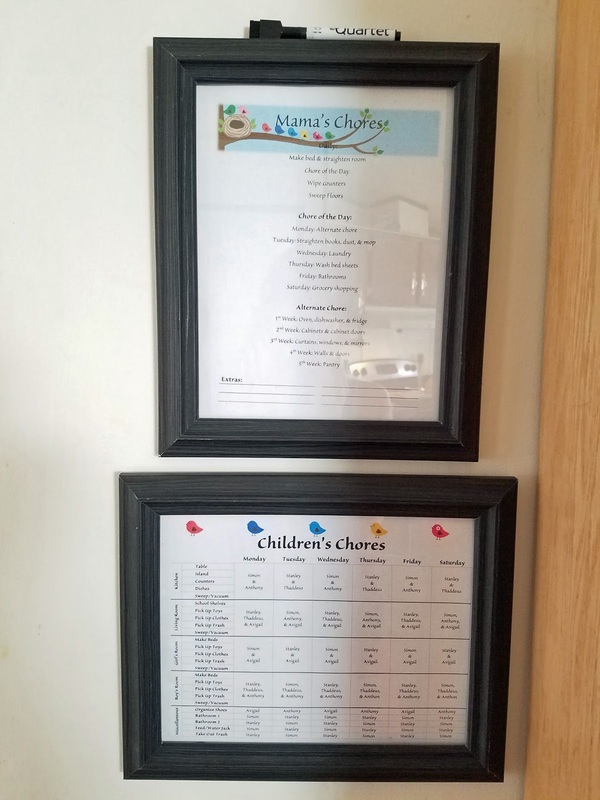 I keep both charts hanging on my kitchen wall in picture frames and we use a dry erase marker to cross off chores that were completed... who doesn't feel a sense of accomplishment when crossing things off to do lists?! We don't have a set time of the day that we do our chores. 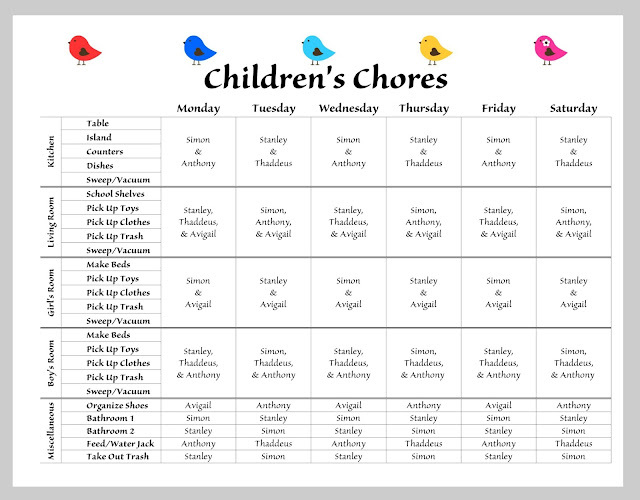 I mainly try to do them after school lessons have been completed and some chores, like kitchen and living room, we work on as needed, but we also try to get them done before Mr. Chickadees comes home. It's very easy way to clean your home. You can use natural cleaner because it is non toxic and healthy for environment.